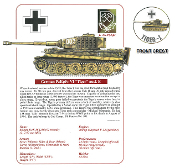 WWII German Tiger tank commanded by Michael Wittmann, 2nd Comp., SS Panzer Abt. 101. Small crest on front, large design on back. Large design features historical text and tank specifications. One-sided design has large image on front, nothing on the back. Available as a T-shirt or a Sweatshirt. Comes in Ash-Grey, White or Natural.